Visitors come to beautiful Lake George for a chance to experience the scenic Mammoth Lakes Basin at its best. Area activities include lakeside camping, scenic hiking, and abundant fishing. Located in just outside of town in the Mammoth Lakes Basin. Explore the waters via kayak or canoe, or spend the day fishing. Enjoy one of Lake George’s scenic Lakeside campsites, available on a first-come first-served basis. Lake George (elevation 9,250), nestled in the beautiful Mammoth Lakes Basin, offers visitors access to abundant outdoor activities and beautiful alpine scenery, all within a short drive of Mammoth Lakes. Lake George is located just outside of town in the Mammoth Lakes Basin off of Lake Mary Road. The best time to visit is from late May through early October as heavy snowfall may make the roads impassable during winter. Camping is available from late June until early September. Fees are approximately $18 per site, and all sites are available on a first-come first-served basis. Lake George is a great jumping off point for many hiking trails in the Mammoth Lakes area. 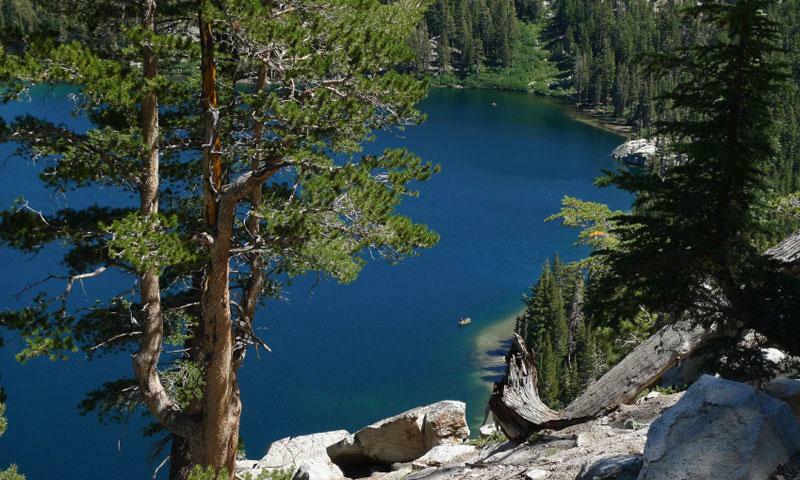 One of the favorite area hikes is to the Upper Lakes Basin, including Crystal, Barrett and TJ Lakes. You’ll find the trail head in the Lake George Parking lot. The shortest hike, to Crystal Lake, is approximately 2.5 miles round trip. For a full day of exploring, consider hiking to Barrett and TJ Lakes as well. Their trail is available from the same parking lot. Lake George is a great spot for trout fishing close to town. Expect mostly rainbow trout. Fishing is available both by foot and by boat. Lake George is a great place to enjoy the water by kayak and canoe. Remember, all the lakes in the Mammoth Lakes basin, except Horseshoe Lake, are closed to swimming, so make sure to stay in the boat.